Finally! The Trinity Collar Jacket, reworked, renamed and ready! I have to say I was happy to rework it to include variations: shorter collar/longer body; longer collar/shorter body; cap sleeve or 3/4 length, options I didn't have in the original version. Except the cap sleeve, when I had it on my dress form before I did the sleeves I really liked the look of it and was going to include that, easy enough with a top down construction! 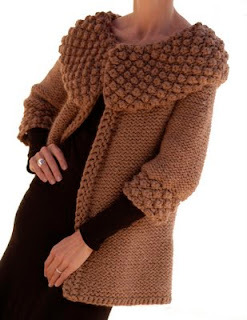 Speaking of construction, this jacket is worked from the top down in Stockinette stitch with the collar worked separately in Trinity Stitch then attached by either a 3 needle bind off or grafting. 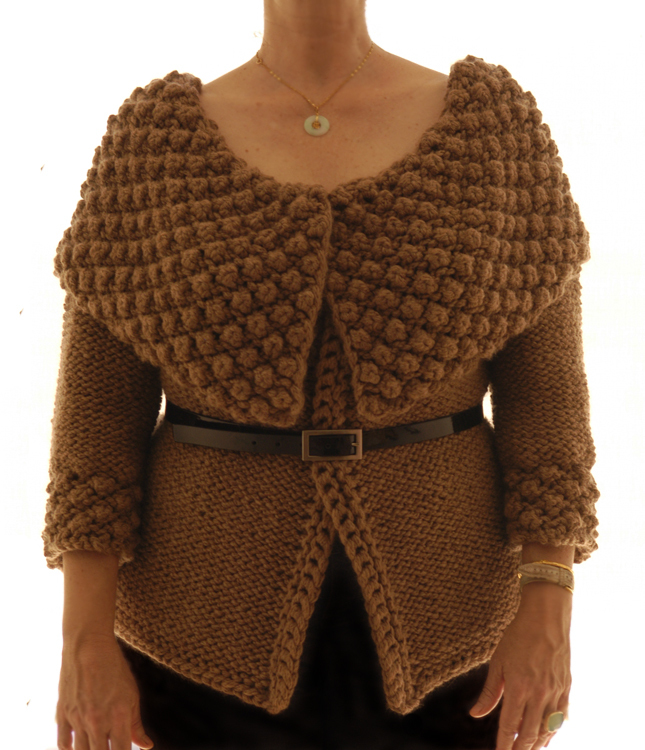 It is buttoned at the top only with 2 crocheted buttons and is meant to be worn belted not bad looking without though. 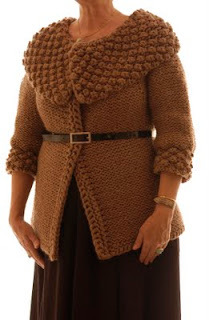 The variations are all noted throughout the pattern and though the body is worked in Stockinette it is worn as Reverse Stockinette. The longer collar is adjustable by buttoning one side underneath the other to create a fuller look. The materials you'll need are #15 & 17 circular needles. Blissa chunky alpaca (130yds) by the BagSmith. 5(5.5, 6) Skeins for the shorter collar/longer body. 5(5, 5.5) skeins for the longer collar/shorter body. For cap sleeve/vest version subtract one skein. 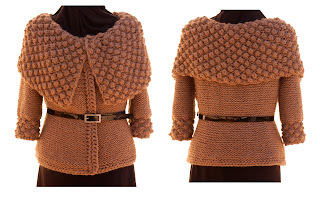 I would rate this for an intermediate knitter. The jacket pictured in all photos is a Large. When I first made this jacket I so liked the shorter body with the longer collar I was definitely biased in how I looked at the 2nd version with the longer body/shorter collar. But the more I look at it I would be hard pressed to know which one I would make for myself! Unfortunately for me I had to send this off to the BagSmith but if you're going to TNNA next weekend head over to their booth where you'll be able to see it in person and feel it! You will fall in love with this yarn! You are such an inspiring designer! what a gorgeous design, I love the options it gives you. Such a clever pattern! I really like the longer body/shorter collar - it kind off has a 60's coat like feel too it. I also think the shorter body/ longer collar adjusted looks pretty cool - the shape of the collar is terrific! I have just completed the collar and am ready to move on to the yoke...but I don't know whether I should use size 17 or 15 needles. I don't see it on the pattern (The collar didn't specify either, but I deduced it was with 17 because later on it says "switch to size 15."). Love the pattern...it seems to be a real show-stopper. Will post pics as soon as it's done, and would then like to move on to one in red with a khaki collar. Love the vintage car-coat look! Thanks for pointing that out! Keep working the body with the #17. I look forward to seeing your photos & would love it in 2 colors as well! If you make one like that please send photos! I was just about to start your infinity scarf for my daughter for Christmas and thought I'd look around at your other patterns. I just stumbled upon this BEAUTY!! You always inspire me with your creations Karen. 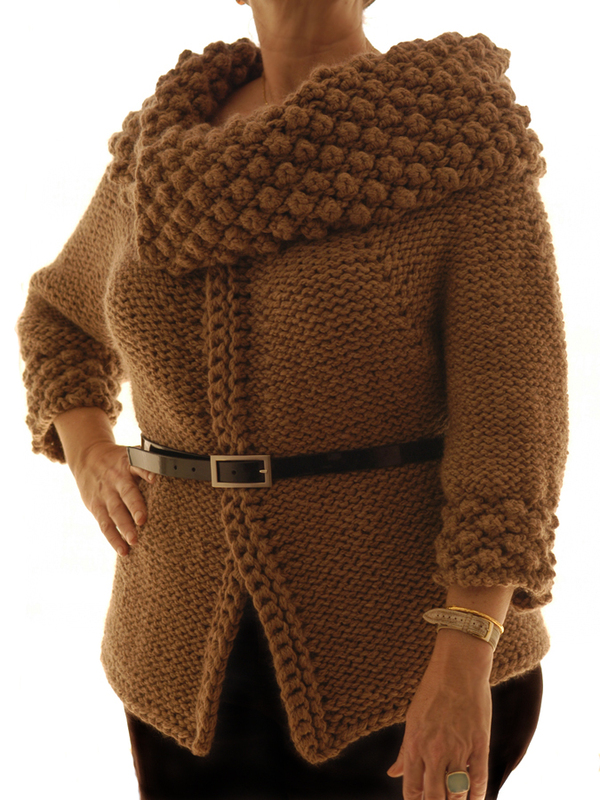 I'm glad the scarf is a quickie because I know what I want to knit next. Thanks again Karen! !